There are plenty of fab tutorials in Estonian version of the page - you can check them out HERE. Don't speak Estonian? No problem just crab Google Translate and follow clear and good photos of the instructions. Happy discovering! Project is supported by EAA and Norwegian Financial Mechanisms through Fund for NGOs. Do you have old buttons in the house ? I am sure you do, and if not I am sure you know someone who does. 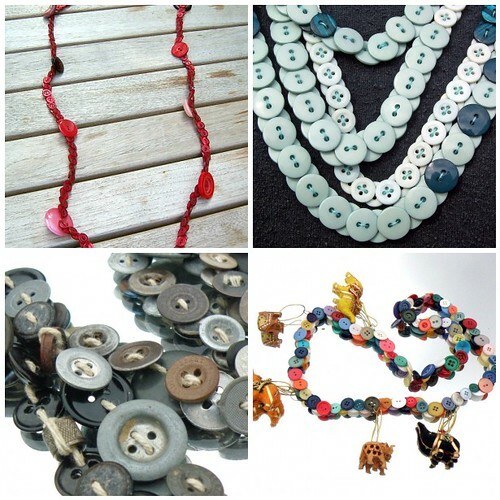 Don't throw them away, because they can become a very lovely necklace. 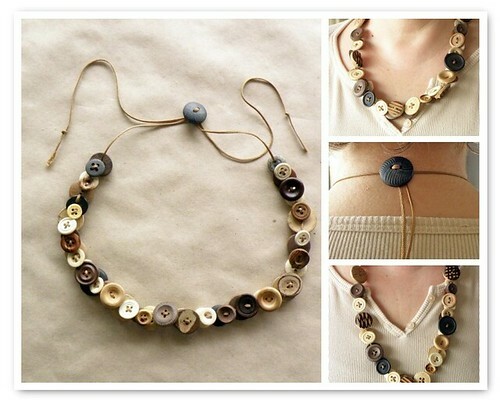 For this tutorial I gathered a lot of old bone, wood and coconut buttons. But you can use all other kind of buttons just as you want. So, here we go. Measure about 150 cm of the cord and cut it off; thread this piece on the needle you are going to use. 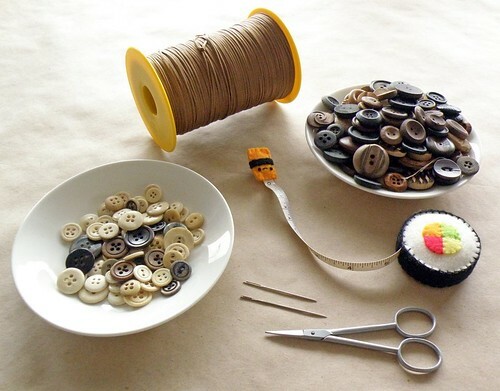 Then you take your first button and string it on the thread: from the wrong side of the button to the right side in one hole, and then back again through another hole from the right side to the wrong side of the button. Shove the button to a distance of about 40 cm from the other end of the cord. 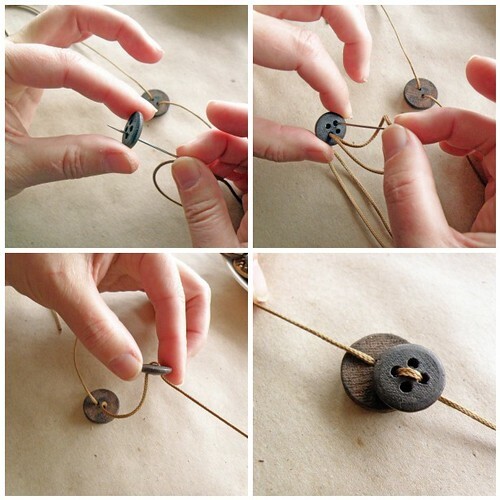 Take another button and string that on the cord in the same way as the first button; thus, from the wrong side of the button to the right side in one hole, and then back again through another hole from the right side to the wrong side of the button. Shove the button on to the first button; the two buttons will now face each other with their wrong sides, and both right sides are showing. Repeat step 2 as long as you like the necklace to be (I made it here about 50 cm long). Step 4: the adjustable closure. 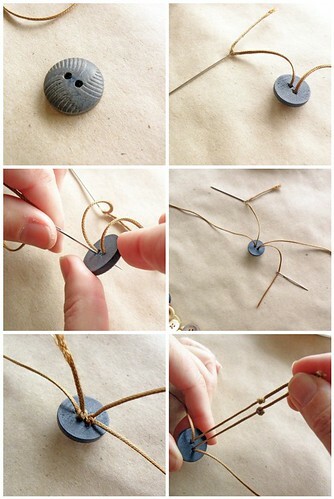 Take a button with 2 really big holes (the cord has to go twice through each hole). String it on again, but do not shove it to the others; leave it at about 10 cm from the end of the cord. Thread a needle on the other end of the cord (remember we shove the first button up to about 40cm of that end). Now you string this big button again but in exactly the opposite direction; where the first cord end comes out of the button, you go in now with this second end, and you come out with this second end where the first cord end is going into the button. Now you knot each end, so that they cannot slide out of the button. By pulling both ends you can make the necklace as long as you want (both ends of the cord slide through that one button in opposite directions). And the necklace is ready! 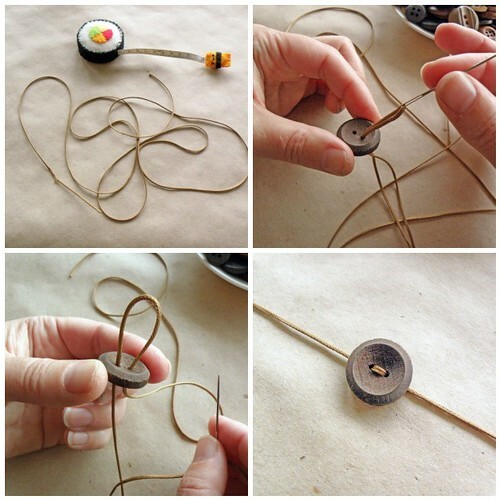 As I said before, you can do this with all the buttons you can find and all possible cords (you can even use elastic cord to make a bracelet); so, at the end of this tutorial some more examples with different buttons and cord. this is great! i'm going to try it out. how about the bags? when are the deadlines for that? Thanks! 5th theme (for June, July and august 2010) is "Playing on the green grass" / AQUA" NB! As it is time for summer vacation, deadline for this theme is 10th of September. This is absolutely AWESOME! Found you on pinterest and fell in love! I saved these a very long time ago. I looked at it again today and am very inspired by this necklace. I have oodles of old buttons that I was going to get rid of. Not any more. Thank you so much for this post. Your work is delightful! Rebecca, thanks you so much for this wonderful comment :=) I hope your necklace will look fabulous!